Can you guess which is the oldest living city in Europe? No, not Rome, not Athens, not even Constantinople. Allow me to introduce you to my hometown – Plovdiv, the second-largest city in Bulgaria. Plovdiv has been continuously inhabited for EIGHT millennia with the first evidence of civilization dating back to 6th century B.C. Numerous nations have left their mark on the 12-meters thick (39-foot) cultural layers of the city. Originally a Thracian settlement, the town was subsequently invaded by Persians, Greeks, Romans, Bulgars, Crusaders, and Turks. During its history, Plovdiv has been known by different names – Evmolpia (Thracian), Trimoncium (Roman), Philippopolis (Greek – after Philip II of Macedonia who conquered the city in the 4th century B.C.) and Filibe (Ottoman/Turkish). When is the best time to visit Plovdiv? NOW! Plovdiv will be European Capital of Culture in 2019 and the city is putting on its best dress for the occasion. May and June are my favorite months weather and light-wise if you are planning on taking photographs 🙂 And if I am not around to show you my lovely town, you can go for a walk with Free Plovdiv Tour – done daily in English in any weather. Kapana (Trap District) – I have to start with the most popular arts & crafts neighborhood in Plovdiv. Narrow cobblestone streets twist around in a non-grid pattern (hence the name “The Trap”), coffees and restaurants spread their outdoor tables at every corner, bars work till the early hours of the morning and an incredible mixture or cultures, ages, races, and colors surrounds you. Best time to visit is on the Friday of the annual Kapana Fest in June, which just happens to be the biggest music, art, and craft street festival in Bulgaria and is completely FREE for the public to attend! Old Town Plovdiv – built in the 1800s and still featuring some of the finest houses of the richest merchants in the area, this historic neighborhood has its own festival in September but is a must-visit on your trip to Plovdiv any day of the year. Walk around, feel the 19th century spirit, take a picture of Hisar Kapia, enter the St. Konstantin and Elena Church and stop by the recently renovated Klianti House to see a prime example of architecture, home decor and wall murals from the 1800s. Djumaya Djamiya (Mosque) – legend says that in the 1200s this was an old Christian church that was turned into a mosque by the Turks in the 1400s. Proof can be found in the nine domes ceiling (vs single dome for most mosques) and in the specific masonry of the outside walls. It is believed to have been the biggest mosque in the Western Ottoman Empire before the one in Edirne was built. Sunset from Nebet Tepe – one of the 3 hills the ancient town of Plovdiv was built on and a favorite place for locals and tourists alike to watch the sunset. “Rahat Tepe” Biergarten is your go-to spot for yummy dinner and fresh seafood. Plovdiv Municipality Building and the Fountain in front – in the middle of the main pedestrian street stand the beautiful municipality building and another famous Plovdiv fountain. It is a popular meeting spot for locals and a great place to experience the famous coffee culture. Singing Fountains in the Central Garden – a small artificial lake with fountains of all shapes and sizes that perform a free light and sound show nightly in summer. Bring a picnic to enjoy or grab a spot at “Morado” cafe/bar next door. Roman Theater – only discovered in the 1960s due to a landslide, it is one of the best preserved ancient theaters in the world. Built in the saddle between two of the three original hills of the town, it was constructed in the 1st century A.D. The theatre can host between 5000 and 7000 spectators and is still in use for outdoor performances and concerts. Roman Stadium – among the largest and best preserved buildings from Ancient Roman times on the Balkans. The stadium was built in 2nd century A,D. and could seat up to 30000 spectators. 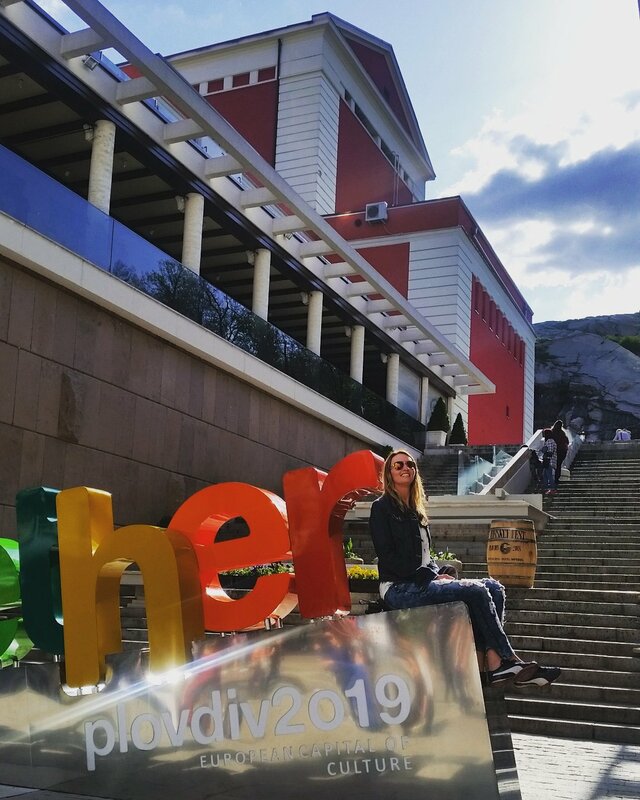 Only a part of it is currently exposed and the rest runs under the main pedestrian street all the way from Djumaya Djamiya to the stairs towards Sahat Tepe with the Plovdiv 2019 sign. Cafe Culture and the meaning of “Pulen Rahat” and “Aylyak” – my favorite part of Plovdiv and the reason why I enjoy visiting in May and June so much! With the first whiff of Spring comes the warmth and that in Plovdiv means all the cafes, bars, and restaurants open their outdoor seating, the streets are full of shiny, happy people lounging around, drinking coffee and doing nothing. It is not uncommon to go to 3-5 cafes in a day over the weekend, meet all your friends, their friends, make new friends and turn people watching into an art form!”Pulen Rahat” means complete pleasure and “Aylyak” is the local form of loose and carefree lifestyle, spending hours in the shades of cafes, idly rambling back and forth on the main pedestrian street and enjoying life in a non-rushed, easy manner. Всъщност името е Цар Симеоновата градина, но да не издребняваме.